Dubai, June 16, 2009 - THQ (UK) Limited and Pluto, one of the region’s leading distributors of home entertainment and consumer technology, announced the launch of Red Faction®: Guerrilla™ in the Middle East. The third installment of the critically acclaimed Red Faction® franchise is released in the region with Arabic subtitles and is available on Xbox 360® video game and entertainment system from Microsoft and PLAYSTATION®3 computer entertainment system. Featuring a robust multiplayer component, Red Faction: Guerrilla is a 3rd person, open-world action shooter set on Mars, 50 years after the events of the original Red Faction. Players will take the role of an insurgent fighter with the newly re-established Red Faction movement as they battle for liberation from the oppressive. 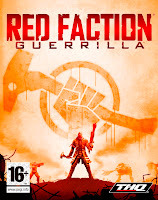 Utilizing improvised weapons, explosives and re-purposed mining equipment and vehicles, Red Faction: Guerrilla allows players to tear through fully destructible environments in an unforgiving Martian landscape swarming with EDF forces, Red Faction resistance fighters, and the downtrodden settlers caught in the cross-fire. Furthering its commitment to the region and in line with its expansion strategy, Pluto recently announced its new brand identity and operations structure for the Middle East. Pluto acts as the parent company for subsidiaries that include Pluto Channel and Pluto Games.